The Icebergs Bondi Baths have been a landmark of Bondi Beach for over 100 years. For more than a century, Tasman Sea waves have crashed against - and into - the Bondi Baths, an Olympic-size pool that became the home of the Bondi Icebergs, a winter swimming club, in 1929. Because of its solid concrete construction, the pool is always slightly colder than the ocean, even though it uses the same water. The public is welcome here, but locals who want to become Icebergs (i.e., earn their official stripes as winter swimmers) must log 75 swims here during what most would consider the 'off-season' (when pool temps dip below 15C in wintry July). Casual visitors favour summertime dips, when the water warms to the high 20s by February. Upon emerging from the striking shoreside pool at the Icebergs, bathers enjoy the amenities of its modernist, beachy clubhouse complex, which includes a gourmet bistro, two bars, fitness facilities and a 1,600-square-foot sundeck. This image belongs to the travel and nature stock photo library. This stock photo of Sunrise at Bondi Icebergs is available for licensing for commercial and editorial uses including websites, blogs, books, magazines, brochures and advertising. Restrictions may apply for images which contain third party copyrighted material or sensitive subjects. Photos of artwork are for editorial use only. 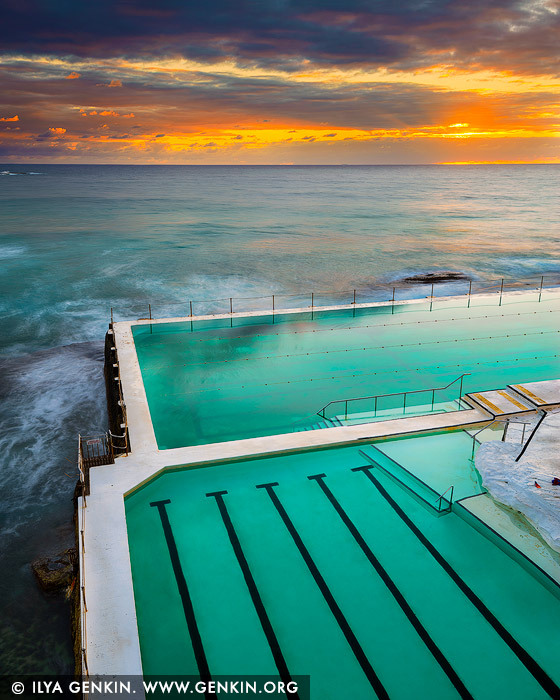 This image id AU-BONDI-BEACH-0004 of Sunrise at Bondi Icebergs, is copyrighted © by Ilya Genkin. This is not a public domain image.